Is Kenya's Super Rail Service Putting Drivers Out of Work? President Uhuru Kenyatta launches the cargo freight services of the standard gauge railway at the Port Reitz station in Mombasa on May 30, 2017. 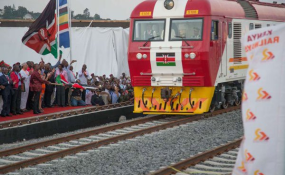 Hundreds of Container Freight Stations (CFS) workers and drivers in Mombasa have been rendered jobless, thanks to increase in the volume of goods transported by train through the Standard Gauge Railway. The Kenya Ports Authority (KPA) issued a directive in June that containers destined to Mombasa for local clearance would not be allowed to be nominated by clients to any CFS. "The nomination shall be done by KPA based on vessel rotation, volumes, and individual CFS capacity; you are required to inform your clients in your various ports of loading accordingly," said KPA in the June statement. On Monday, the Nation learnt that CFSs and transport firms in Mombasa have started laying off workers following reduced business. More than 500 truck drivers and 100 workers in CFSs have been declared redundant after the government ordered cargo to be cleared from Nairobi. CFS Association has already moved to court to challenge the directive and the case is pending. "That directive has totally affected our business. As we speak, I have sacked 30 people from the company. Some have even received their sacking letters today," said a senior manager at one of the CFSs in Mombasa who asked not to be named. He said the CFS receives very little cargo that can no longer sustain its business. "The work that we used to do has now been transferred to Nairobi and we can no longer pay our staff. All the CFSs in Mombasa are facing a bleak future. There is no future in this business anymore," he said. "Now even the little cargo that KPA has allocated to us, Kenya Revenue Authority(KRA) wants port clearance. That begs the question, is it that there is scarcity of jobs or just that they want to end the CFS business. These actions tell us that there is no hope in this business," he said. Some CFSs have also been forced to relocate to Nairobi or start branches there. A number of businesses that relied on the CFSs and transporters in Mombasa have also been affected as local economy feels the pinch of transfer of business to Nairobi. Apex steel company assistant manager Daniel Ndege said the company is feeling the heat of the directive as it is incurring unnecessary costs. "The issue is that they are trying to force us to transport the containers to Nairobi and for us we do nominations on our side. If we do nominations, we have the full mandate to nominate the CFS we need as importers in Kenya. So if you force us to track the containers to Nairobi and we are based in Mombasa, then definitely you are trying to force us to do things and incurring double costs. A container reaching Nairobi and returning it back to Mombasa is a loss," he said. Mr Ndege said SGR should engage in competitive business and not stifle competitors. Kenya Transporters Association operations co-ordinator Mercy Ireri said: "As we speak now, a cargo train carries 108 containers and making seven trips daily. That literally means that more than 500 truck drivers are currently jobless. Hundreds of trucks have no business and this is to the detriment of our members, who have pumped billions of shillings into buying trucks, trailers and other infrastructure," she said. Some 1,300 containers arrive at the port daily.